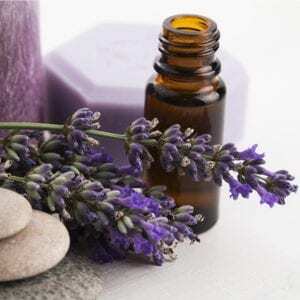 Over the past several decades a number of scientific papers have been published detailing the various beneficial uses of the essential oil of lavender. Going all the way back to the pre-Christian era in Europe, early physicians were describing the use of lavender for its calming and anti-convulsive properties. During the middle ages, one of the most prolific physicians, Ebn-e-sina from Persia wrote many descriptions of the pain treatment and sedative effects of lavender (Gorji, 2003). He was also one of the first to describe methods by which the hydrophobic (doesn’t mix with water) oils of lavender could be extracted using steam distillation. The oil of lavender, as he described, was also important for its topical use in fighting infection. The most frequently discussed application of lavender oil has been for aroma therapy. The inhalation of the key components of lavender: linalyl acetate (51%), linalool (35%), and trace amounts of terpinen and camphor, (Woronuk, et. al., 2011) are thought to be the key sources of its anti-anxiety, mood stabilization, and sedative properties (Setzer, 2009). Several recent authors have stated that various types of lavender have medicinal effects and others do not. Malle and Schmickl, 2015, for example, state unequivocally that Lavendins (sterile hybrid between English augustifolia and Portuguese latifolia lavenders) “contain a very high amount of oil. In contrast to regular lavender, however, it has no medicinal effects.” This has been shown to be false, in that all lavenders/lavendins contain the same active ingredients, just in varying amounts. “[All] the various lavenders have similar ethnobotanical properties and major chemical constituents (Cavanagh & Wilkinson, 2002). A second, well-discussed treatment mode is the oral consumption of essential oils of lavender for the pain blocking and gastrointestinal maladies (Barocelli, et. al., 2004). Many recipes for lavender teas and tonics have appeared throughout the ages alleging curative powers for poor digestion, menstrual cramps, dyspepsia and other internal ailments. The final treatment mode—topical application—has fewer instances of clinical trial, but holds an interesting promise for future research. The specific characteristics of lavender essential oil that are of most interest are those related to its purported anesthetic and anti-bacterial properties (Ghelardini, 1999). In specific, the topical application of lavender oil for the treatment of burns and wounds has begun to have a number of examples cited in the literature (Hartman and Coetzee, 2002). Let us know if you have similar experiences with the use of topical applications of essential oils of lavender! Barocelli E, Calcina F, Chiavarini M, et al. 2004. Antinociceptive and gastroprotective effects of inhaled and orally administered Lavandula hybrida Reverchon “grosso” essential oil. Life Sciences.76(2):213–223. Cavanagh HMA, Wilkinson JM. 2002. Biological activities of lavender essential oil. Phytotherapy Research. 16(4):301–308. Ghelardini C, Galeotti N, Salvatore G, Mazzanti G. 1999. Local anaesthetic activity of the essential oil of Lavandula angustifolia. Planta Medica. 65(8):700–703. Gorji A. 2003. Pharmacological treatment of headache using traditional Persian medicine. Trends in Pharmacological Sciences; 24(7):331–334. Hartman D, Coetzee JC. 2002. Two US practitioners’ experience of using essential oils for wound care. Journal of Wound Care. 11(8):317–320. Malle B and Schmickl H. 2015. The essential oil maker’s handbook. Spikehorn Press. Pp 79-80. Setzer WN. 2009. Essential oils and anxiolytic aromatherapy. Natural Product Communications. 4(9):1305–1316. Woronuk G, Demissie Z, Rheault M, Mahmoud S. 2011. Biosynthesis and therapeutic properties of lavandula essential oil constituents. Planta Medica. 77(1):7–15.